Select Project -> PIC Wizard / 24 Bit Wizard from the ribbon along the top of the main window or from the menu bar if using the classic style IDE. In the prompt that appears, choose the directory and file name in which to save the project. 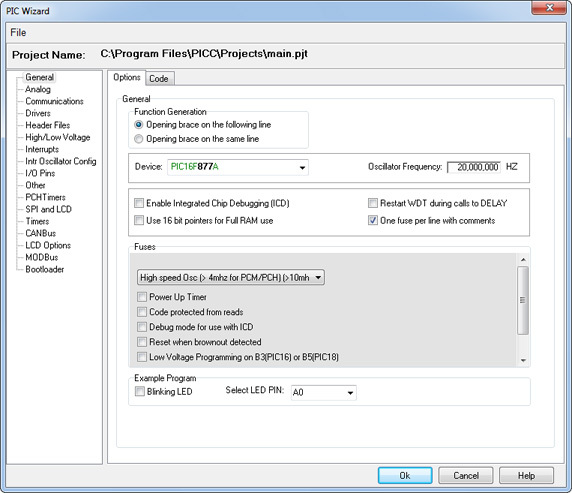 When the PIC Wizard window appears, the list on the left-side will display all of the modules and other features that can be modified for the current project and selected PIC® MCU or PIC® DSC. The Options tab on the right-side of the window displays the settings that can be modified for the selected module. The Code tab will display the code generated from the current module settings. General Select PIC® MCU or PIC® DSC, fuses, and oscillator frequency. Communications Enable RS-232 and I2C subsystems, along with selecting pins, speeds, and other transmission options. SPI & LCD Enable SPI modules along with Master/Slave, mode, and clock settings. If there is a Segment LCD Driver present, selection of the LCD running mode and segment pins used will be available. Timers Enable Watch Dog Timer and selection of the time-out period. Enable Timers 0, 1, and 2, along with selecting a clock and timer resolution. PCH Timers Enable Timer 3 on PCH PIC® MCUs along with selecting a clock and timer overflow resolution. Analog Select analog pins and settings for voltage range, resolution, and clock speed. Other Enable Capture, Compare, and PWM subsystems along with setting the reference voltage levels, output configuration, and shutdown options. Interrupts Select events that cause interrupts. Drivers Select additional IC chip devices connected and include driver files. I/O Pins Select I/O pins' purpose and enable pull-up resistors. High/Low Voltage Enable Voltage Detection along with setting the voltage levels required to trip the system. Internal Oscillator Configuration Enable Internal Oscillator along with selecting clock frequency and run modes. Header Files Select header files to include in a project. CAN Bus Enable CAN Bus along with setting the communication rate and devices being used. LCD Options Enable Character LCD along with selecting pin connections and address locations on the LCD. MOD Bus Enable MOD Bus along with setting the status, device addresses, and communication pins and speed. Boot-Loader Use a boot-loader at either the start or end of program memory. The 24 Bit Wizard uses the same options as above, but may be listed under different headings. After all the modules and features are setup, click Ok and the wizard will generate code for the project and save it in the directory specified earlier. For additional help using the PIC Project Wizard, contact CCS Technical Support.